Pasadena is best known for its roses and architecture, both of which are embodied by one structure – the Rose Bowl. Designed by famed Pasadena architect Myron Hunt, the stadium was built specifically for the Tournament of Roses Association’s New Year’s football game. The Tournament hoped that the game would become internationally renowned, and in fact the “granddaddy of them all” is an annual highlight for sports enthusiasts worldwide. In addition to the New Year’s game, the multifaceted stadium has played host to a variety of events that have made it a truly well-rounded bowl. The Rose Bowl’s field has been transformed throughout the years for other athletic events, playing host to midget car and motorcross races, rodeos, track and field meets, marathons, bicycle races, and even frisbee competitions, which brought the famous Ashley Whippet to Pasadena. Both the summer Olympic games and the FIFA’s World Cup championship have come to Pasadena more than once. In 1932, the Rose Bowl was used as the cycling venue for the summer Olympics in Los Angeles. 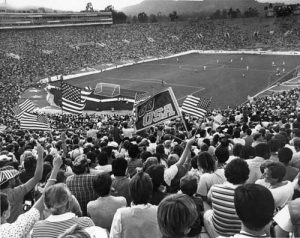 When the Olympics came back in 1984, the Rose Bowl hosted soccer games, including the finals. International soccer came back to the Rose Bowl for the Men’s World Cup in 1994 and the Women’s World Cup in 1999. The bowl’s size made it the ideal finals venue, and brought visitors from around the world to Pasadena. 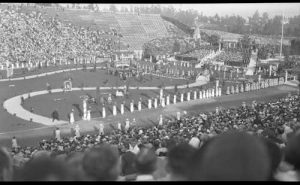 The large capacity of the bowl has also made it the ideal location for numerous non-athletic events, including political and religious rallies, concerts, circuses, and other entertainments. Some of America’s greatest bands and entertainers have brought their stages to Pasadena to perform on the Rose Bowl’s field. Since it was built, the stadium has played an important role as a community center for Pasadena. It has held graduation exercises for many Pasadena schools. The size of the stadium allowed for mass graduation ceremonies with spectacular pageantry. The décor for the 1924 graduation ceremony included bridges, benches, and even a windmill. Local schools and organizations have used the stadium for various children’s events. The Rose Bowl is the home of the largest local flea market, and many residents walk, jog, or bike along the loop surrounding the Rose Bowl. The stadium has provided Pasadena schools with a home football stadium, and played host to the annual Turkey Tussle match up between Pasadena High School and John Muir High School. The multi-purpose stadium has surpassed its original function to become an historic icon, an ideal arena for any sport or event, and a community center. The stadium in the Arroyo is featured in nearly every advertisement for the city of Pasadena, and for good reason. The bowl is utilized for important city events, and major events at the stadium impact the entire city. The Rose Bowl represents more than the Tournament of Roses, sports, and even the Arroyo Seco – it symbolizes the spirit of Pasadena. 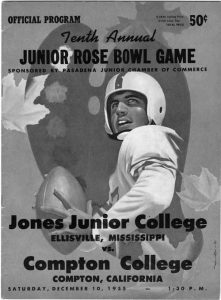 This article, which was excerpted from The Rose Bowl (Michelle L. Turner & Pasadena Museum of History, Arcadia Publishing, 2010) was originally published in the 2011 Winter issue of The Quarterly. The Rose Bowl is available for purchase in the Museum Store.